The Zeiss Cirrus HD-OCT, is a non-invasive technology originallyused for imaging the retina - the multi-layered sensory tissue lining the back of the eye. It is particularly good at picking up the early signs of Age Related Macula Degeneration in the early stages when treatment is most successful. 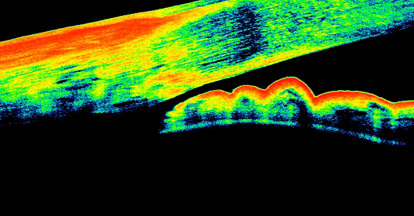 The Optical Coherence Tomography (OCT) scanner is further used in assessing the thickness of the Retinal Nerve Fibre Layer adjacent to the Optic Disc (Optic Nerve Head). 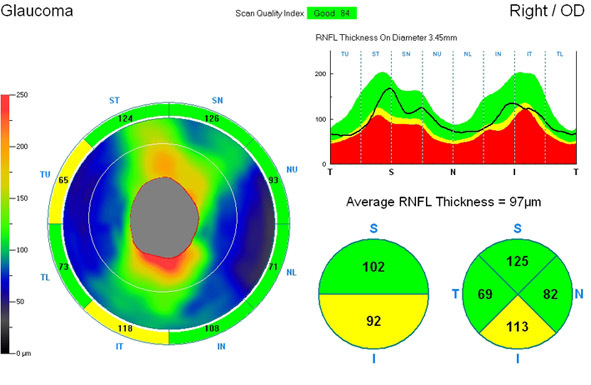 This gives us a measurement and a map of Retinal Nerve Fibre Layer thickness. This will become our base for accurate quantitative data for more efficient long term monitoring for early signs of Glaucoma. In Glaucoma and some other conditions, the nerve fibres leaving the eye via the optic nerve head die off and thus assessing the thickness of this nerve fibre layer can often show the early signs of Glaucoma before the damage can be demonstrated by more convential methods such as Visual field Testing. Glaucoma may thus go undetected in people with thin a cornea or might be mis-diagnosed in people with a thicker cornea. In addition, having a thin cornea is an independant risk factor for Glaucoma as it may mean that the Optic Nerve Head is more vunerable to Glaucoma damage. With its advanced, next generation, precise algorithms, The Zeiss Cirrus provides Matheson Optometrists with highly detailed, high-definition maps and images of the macula and retinal structures. 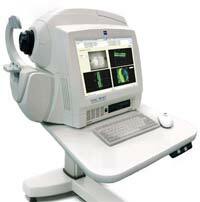 This allows us to make the most accurate diagnosis possible. One of the other important benefits of this form of retinal scanning is that being able to scan the various layers of the retina not normally visible when an optometrist or ophthalmologist can let us detect the early signs of conditions such as Wet Macula Degeneration, Epiretinal Membrane and Macular Holes, often before it is visible by conventional methods. Because the more common Dry Macular Degeneration can change to the more agressive and nowadays, often treatable Wet Macular Degeneration, screening patients with dry macular degeneration with Optical Coherence Tomagraphy (OCT) can often pick up this change in type early enough for treatment to be started effectively.